Graduation is officially less than a month away for me - yay! 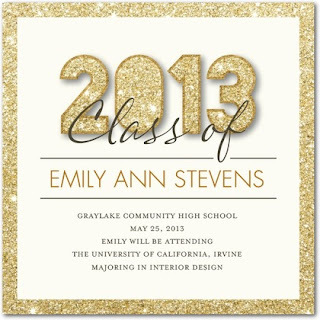 I've had lots of friends and viewers ask where they should purchase graduation invitations and thank you's (because the vendors that colleges suggest are usually ridiculously expensive, am I right?). 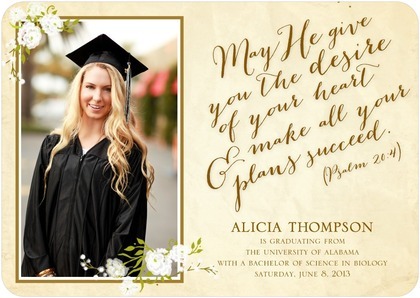 I recently discovered a fabulous company, Tiny Prints, who makes personalized stationary, cards, thank you notes, andddd graduation announcements/invitations! I ordered some personalized thank you letters to send out to my family and friends after they send graduation gifts. I loved this design because you can add a photo and your name to the front. My parents love it and I love the touch of glitter-like font in the "2013" year. I also added a personalized note and my "signature" on the inside of the card. 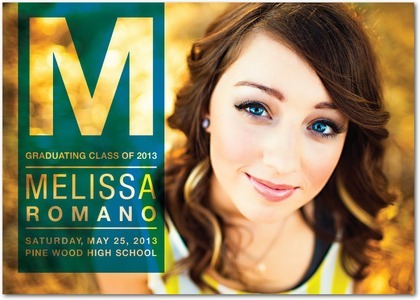 They have just about everything you could want printed, but I'm really loving all of their options for graduation invitations and supplies. There are literally pages of options, all beautiful! Be sure to pass this site along to your high school and college upcoming graduates. Graduations are coming up, so place your order quickly. I'm definitely a fan of the first one (momentous) you listed! Sounds very exciting! You look great!